Clear Lake is a large recreational boating area near the Houston City limits that is located on the west side of Galveston Bay about 71 miles west of Sabine Pass and 48 miles northeast of Freeport. Lined with marinas and yachting facilities with plenty do do ashore, Clear Lake has plenty of exploration opportunites for boaters of all interests. The entire length of Clear Lake stretches some six miles from its opening into Galveston Bay southwest all the way to League City. Technically, Clear Lake is bounded on the north by the town of Seabrook, while Kema lies to the south. 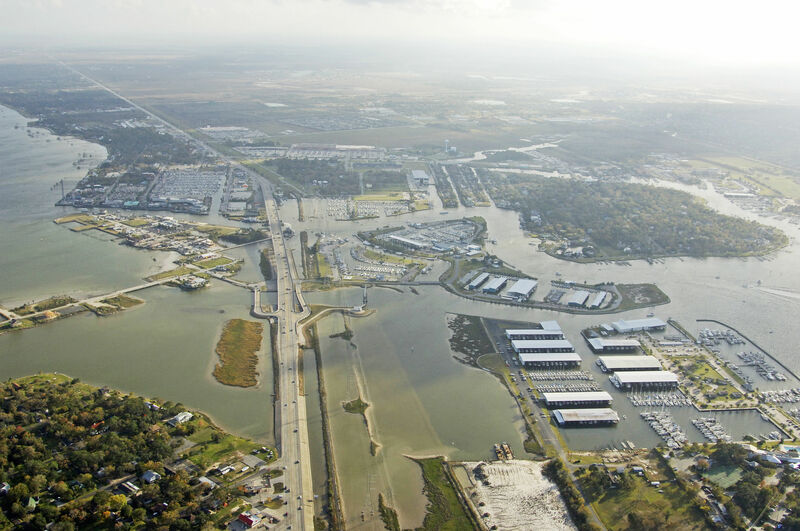 The southern shore of Clear Lake has the heaviest collection of marinas and yachting facilities, especially in the Clear Creek area around the high fixed bridge near Clear Lakes entrance. Within a short distance to all the marinas, cruisers can find an assortment of excellent restaurants, grocery stores and markets, drug stores and all other manner of facilities. If you are in need of something specific, check with your marina for details. The image above is a view from the south looking north over Clear Creek in the area of the state Route 146 fixed bridge. 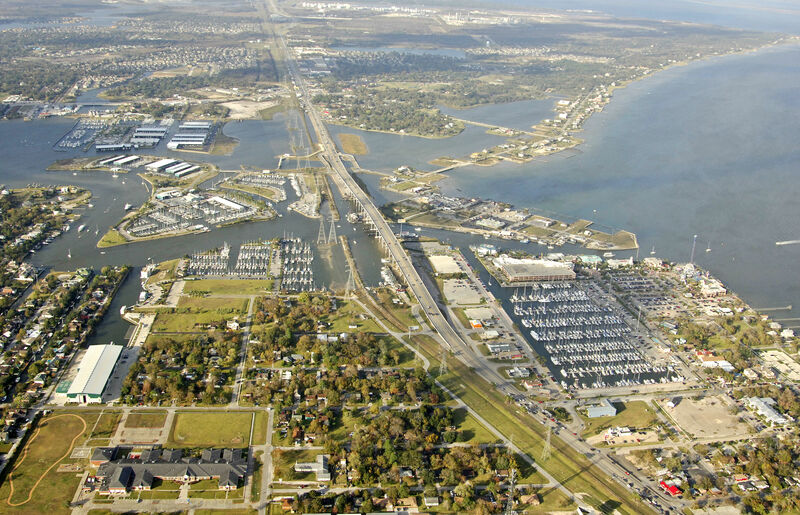 The marina to the bottom right (south) is the Kemah Boardwalk marina, while Portofino Harbor lies just to the west (left) on the other side of the bridge. Seabrook Marina houses several different facilities and is jut north of Portofino Harbor. 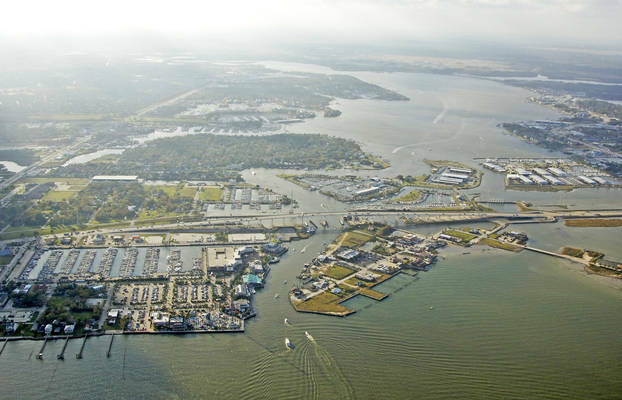 The approach to the Clear Lake Inlet is from the east via Galveston Bay. First, set a course to intercept the area near waypoint 29 33.227N 94 58.903W. Once you have arrived near the waypoint, set a course of about 261 degrees magnetic for about a mile to pick up green daybeacon 1 and flashing red 2 at the approach channel to Clear Lake. Once you have picked up green daybeacon 1 and flashing red 2, work your way down the channel past flashing red 4, green daybeacon 5, flashing red 6, green daybeacon 7, and finally quick flashing red 8 at the cut into Clear Lake. Depths along the entrance range from 10 to 12 feet. Inside, you will first see the Kemah Boardwalk Marina to port, just before a high fixed that bridge crosses Clear Creek with a vertical clearance of 73 feet. After you pass the fixed bridge, you are technically in Clear Creek and the Portofino Marina will appear to port and the large island housing the extensive Seabrook Shipyard shows up to starboard. Several other marinas doth the shoreline of Clear Lake. 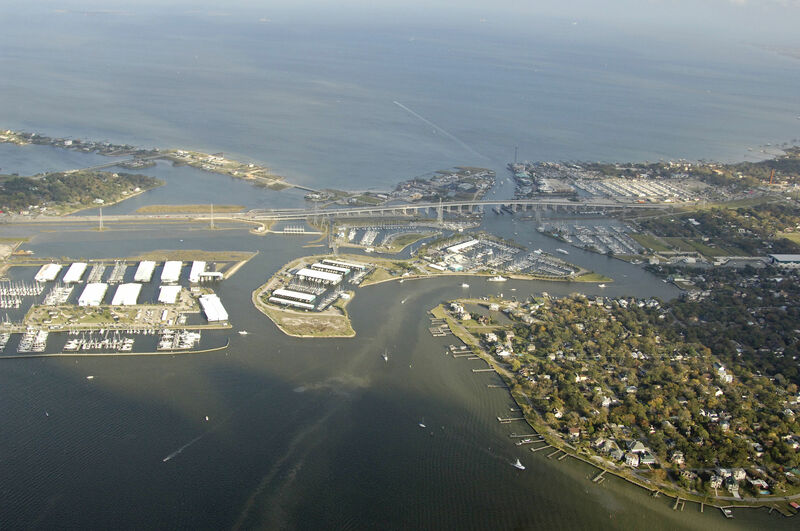 For details on facilities, amenities, or to make a reservation, see our detailed marina listings for the area. Experience space at The Feel of Space Show. Be sure to visit the Space Center in Houston! Clear Lake does not have an organized public transportation system, but a local company, Clear Lake Shuttle, can take visitors back and forth to Houston and surrounding areas at a reasonable cost. Once you have hooked up with the Houston Public Transportation System, you can get around on busses or the electric train system that works back and forth in the Main Street area. The Bush Intercontinental Airport is located about 33 miles to the northwest of the Clear lake are and has commercial jet and commuter service to locations around the world. To reach the airport, you must first take the aforementioned shuttle service or a taxi cab to connect with Houstons transportation system. Alternatively, you can arrange for an airport shuttle to come pick you up. See our Helpful Links section below for more details and schedules for Houston and Clear Lake area transportation. No reviews yet! Be the first to write a review of Clear Lake.